Disclaimer: This is not a sponsored post for Quaker Oats. 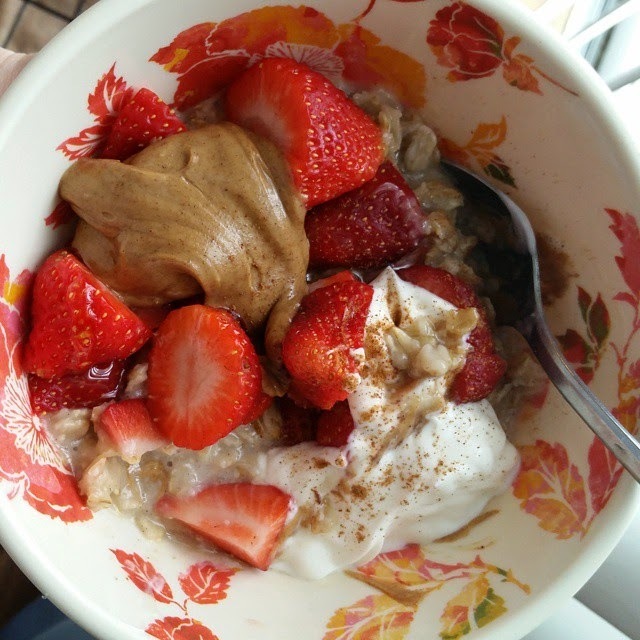 I just love oatmeal and am sharing my creations for tasty and filling breakfasts! I get told, mainly from my mom and a few good friends that I make such awesome creations with my meals. (thanks guys!) It's usually a healthier dessert, a snack or my breakfast with oatmeal. I usually go a few weeks in between without eating oatmeal for the simple fact that I just forget about it. Life get's busy and if I'm not actually starved in the AM, I just have my coffee and start my day. Plain fruit like an apple or banana usually gets thrown in my bag; but let's be real. Those items are boring and sometimes not filling enough. Although, an apple and some nut butter never gets old! And here and tag me @mrs._moderation. Off the cuff creation at work one day. I had brought in cooked oats with some almond milk and happened to have dried cranberries in my drawer and leftover pumpkin from a can. Weird I know. It was Halloween time and I ate something else with the pumpkin a few days earlier. ANYWAY. recipe: "Pumpkin Oatmeal" 1/2 cup oats/ water and 1/2 cup almond milk mixture/ dried cranberries/ about 1/2 a cup of pumpkin puree/ cinnamon/ honey It was really good! Healthy Dessert: OKAY. this one isn't oatmeal but it could still be used for breakfast! Simple and healthy. Strawberries/plain Greek yogurt/ honey or agave/ granola/ and cinnamon I'm sure. I always add cinnamon to this kind of stuff. Apple Oatmeal: 1/2 cup oats/ 1 medium diced apple (Honey crisps are perfect)/ cinnamon/ honey or agave SO tasty! 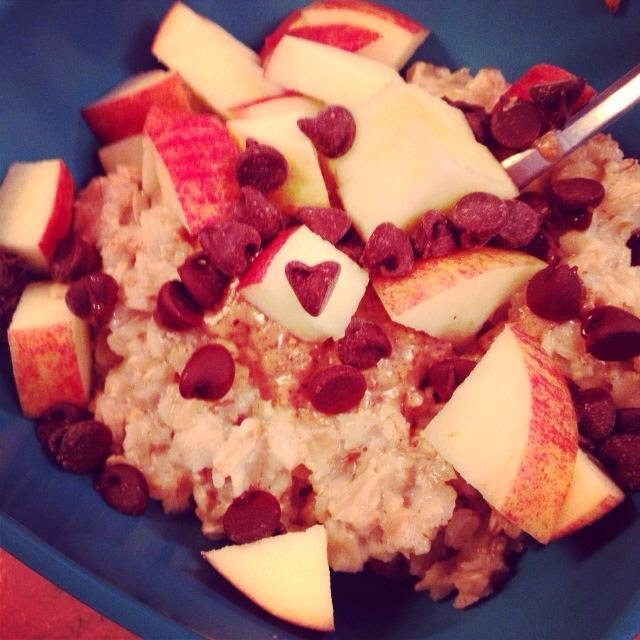 Same as the above apple oatmeal just with added chocolate chips. Because, yes. And as the chips melt throughout the hot oatmeal, Heaven! What's your go-to food in the AM? Do you get hungry in the morning? For me, it depends on the day. If time was ideal every single morning, I'd make oatmeal. This is helpful, especially about the goats. This will be next on the list to make. OMG. oatmeal is always a great breakfast! i love mine with just a bit of nut butter, some dried fruit and/or a little maple syrup. and always made with vanilla extract and ground cinnamon! thanks for the ideas to change it up! I can’t lie, I’ve come to love oatmeal too. I think I’ve come to love it out of forcing myself, but like anything else all you have to do is spice it up a bit so it’s not so boring or so regular. I really like the idea of the almond butter oatmeal. I have a crazy obsession with peanut butter and have found sunflower and almond to be my favorites. I’m going to try this for sure!